Autograph version 4 now available.The world's best 2D and 3D dynamic graphing software plus data handling, statistics, coordinate and transformational geometry just got better. Autograph has had a major make-over, with a fresh new design. Many new mathematical objects have been introduced in both 2D and 3D, and for each object there is an associated list of 'attributes'. The most dramatic features of the new Autograph 4 involve these attributes, which can selectively be used in the new "attribute calculator", or the new "XY" attribute point plot. There is also a ground-breaking new "Argand Diagram" page, enabling complex numbers to be explored through dynamic objects. See the new introductory video, 4 page summary and manual extension Windows 10 compatible and much easier to install. For full details see Autograph. See links below to choose the type of licence you'd like to buy, whether it's a new licence, or upgrade. 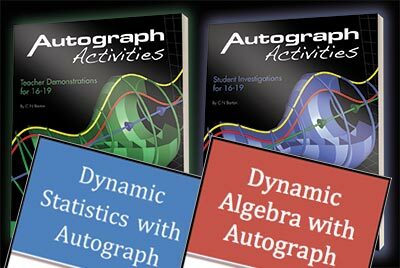 Autograph leads the way in the use of dependent, selectable mathematical objects to help students get to grips with the principles of probability and statistics, and coordinate geometry in both 2D and 3D. Great for use with data projectors and interactive whiteboards. There are two levels of operation, 'Standard' and 'Advanced'. The 'Standard' level has a greatly simplified interface and a reduced set of options for the user - just perfect for age 11-13, whilst the 'Advanced' mode has all this and virtually all you need for more advanced school and college maths too. System Requirements: Windows: Any full Windows system including Windows 10, 8, 7. It requires 200Mb of disk space. Mac: OS X High Sierra. It requires 2GB RAM and 359.5 MB Hard Disk Space.